A bright hunter's moon lights up newly-ploughed fields, vines are heavy with ripe grapes, and the occasional gunshot of a lone hunter breaks the silence of the Marche countryside - welcome to another autumn edition of the Marche Voyager newsletter. One of Italy's oldest sagre, or festivals, dedicated to the grape takes place at Cupramontana in the heart of Verdicchio wine country at the beginning of October. The event, established more than 80 years ago, runs from Thursday 4 to Sunday 7 October, and features a parade of decorated floats, a contest of bare-foot grape crushing, and plenty of chances to try local wine and food. The fertile slopes of the valley of the Aso river, the Valdaso, is known as the "garden of the Marche" and is famed for its celebrated peach, la pesca della Valdaso. The lush valley also hides a handful of beguiling small borghi or medieval hamlets, including Carassai, Monterubbiano, Moresco, Campofilone (famous for its egg pasta), and, in the picture below, Petritoli. An excellent area to explore if your staying in the southern Marche. Two art exhibitions to make for this autumn: in Macerata from 19 October the work of the great late Renaissance painter Lorenzo Lotto is featured in an exhibition that runs until February 2019. Originally from Venice, he spent most of his working life in the Marche and many of his magnificent paintings still grace a number of churches in the region. Meanwhile, the late paintings and drawings of the 20th-century Italian master Giorgio de Chirico are on show in Osimo's Palazzo Campana until 4 November in an exhibition curated by celebrated Italian art critic Vittorio Sgarbi. 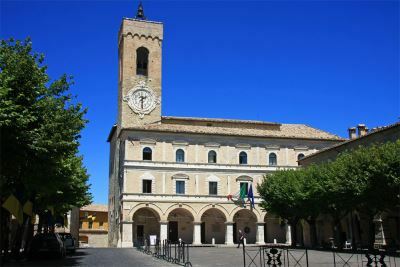 The elegant facade of the town hall fronts Piazza Vittorio Emanuele II, at the highest point of Cingoli, the small town also known as the "Balcony of the Marche" for its panoramic views. Macerata's spectacular open-air opera festival runs next year from 19 July until 11 August and includes two Verdi masterpieces, Rigoletto and Macbeth, alongside Bizet's Carmen. Meanwhile Pesaro's prestigious Rossini Opera Festival, from 8 to 20 August in 2019, includes productions of Rossini's Semiramide and Demetri e Polibio. 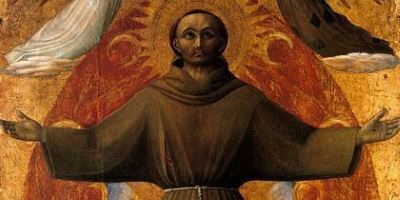 St. Francis first visted the Marche region from neighbouring Assisi in 1208; by 1282 in the Ancona area alone there were some 85 friaries with around 1,500 Franciscans.